MoU between ITIDA and the Korean National Grid Inc. entails the building of an international, multilingual search engine that covers an international ICT database and enables users to view the search output of multilingual international websites in the Arabic language. 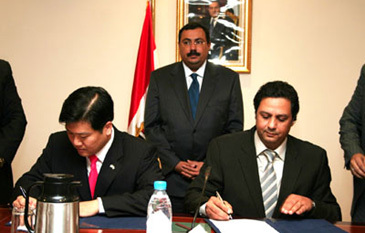 Signing ceremony was witnessed by Minister of CIT Dr. Tarek Kamel and agreement cosigned by ITIDA CEO Dr. Hazem Abdelazim and National Grid Inc. CEO Henry Kihwan Kim (left) co-signed the agreement on Oct. 26, 2008. Minister of Communications and Information Technology Dr. Tarek Kamel witnessed today the signing of a memorandum of understanding (MoU) between Information Technology Industry Development Agency (ITIDA) and the Korean National Grid Inc. on building an international, multilingual search engine. ITIDA CEO Dr. Hazem Abdelazim and National Grid Inc. CEO Henry Kihwan Kim co-signed the agreement. The new search engine will cover an international ICT database and enable users to view the search output of multilingual international websites in the Arabic language. The project aims at enhancing the international competitiveness of Egyptian companies operating in the ICT field and offering new opportunities for diverse technological services like those related to the internet, content and advertising. The search engine is also equipped to offer new developments in language, videos, images, educational and culture material collected from different websites worldwide. The MoU came as a means of boosting ICT utilization for the promotion and development of trade activities as well as expanding the ICT markets between Egypt and Korea. Based on the agreement, ITIDA will provide the necessary database, communicate with major sources of information and help the Korean side get in touch with Egyptian universities and specialized research centers. In addition, ITIDA will contribute to training Egyptian calibers who will work on the search engine. The number of Egyptian employees working on the project is expected to reach 500 over the next three years. On its part, National Grid Inc. will offer the know-how required for building the search engine, provide technical consultations in this domain and contribute to the search engine investments amounted as $10 million. The agreement comes within the strategy of the Ministry of Communications and Information Technology that aims at implementing the Egyptian Information Society Initiative (EISI) as well as boosting Arabic e-content and enhancing its role on the World Wide Web. Located in the heart of modern business environment at the Smart Village, The Information Technology Industry Development Agency (ITIDA) is a governmental entity spearheading the development of the Egyptian IT sector and increasing its global competitiveness. ITIDA, an affiliate of the Ministry of Communications and Information Technology (MCIT), is tasked with the focal role in the developing the IT industry through identifying the needs of the local industry and addressing them with tailored programs. The agency is considered to be a one-stop-shop for foreign investors and a strategic advisor to Multi-National Companies (MNCs) investing in the Egyptian IT sector. It further plays a leading role in enhancing the Egyptian cyber security and data protection framework towards a more secure e-Business and Business Process Outsourcing (BPO) services positioning. National Grid Inc. is a global leader in creating solutions for the emerging field of grid computing - in essence providing superior, cost-efficient and convenient computing power by replacing costly hardware with quality middleware that creates a virtualized grid computing environment to share computing resources. This seamless pooling of heterogeneous resources and intelligent distribution of computing power for faster processes allow the usage of highly detailed and better optimized data, along with improved security and easy usage. The company is also the first in the world to launch and commercialize products to enable convenient and low-cost access to grid computing.